Welcome to Chabad at ASU - your child's home away from home! 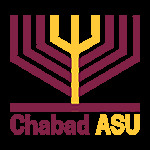 Here at Chabad at ASU, we pride ourselves on creating a "home away from home" for Jewish students at Arizona State University and the surrounding colleges. We serve thousands of Jewish college students, providing them with a wide array of unique and innovative programs helping to create a strong and vibrant Jewish community on campus. We invite you to come and visit us and see first - hand the warmth and Jewish pride your child experiences at Chabad at ASU. We would be delighted for you to join us at one of our weekly Shabbat dinners. It's an experience that will stay with you... forever. In addition, Chabad’s campus family, Rabbi Shmuel and Chana Tiechtel (and their baby Tzvi!) open their home to hundreds of students every week, welcoming them with the warmth of family. Their meaningful relationships with a broad spectrum of students are testimony to the Tiechtel’s personalities and commitment. Chabad at ASU deepens Jewish students' connection to their heritage and to their future by developing their leadership skills, strengthening and revitalizing our entire Jewish community. The incredible programming that we offer would not be possible if not for the generosity of individuals who are committed to ensuring a strong Jewish future. You can make an immediate difference in the lives of students. With the demand for quality programming at on the rise, we invite you to consider partnering with Chabad at ASU by making a gift today. To visit us at Chabad at ASU and to join us for an unforgettable Shabbat dinner, please send an email to parents@chabadasu.com or call us at 480-736-TORA. We're looking forward to personally greeting you!